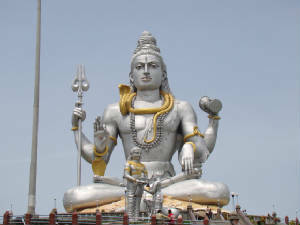 Murudeshwara is a town where world's tallest statue of lord Shiva is situated. It comes under taluk of Bhatkal, Uttara kannada (North canera) district. It is around 450 km from Bangalore. 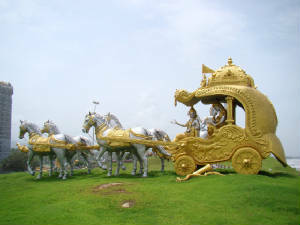 Murdeshwara temple and the beach on which it is situated are very famous attracting the devotees as well as tourists. The statues have been made which pictures the whole story how the shreekshetra 'Murdeshwara' is formed in a cave which has an entrance fee, but worth watching it. The expressions of the statues are awesome...! 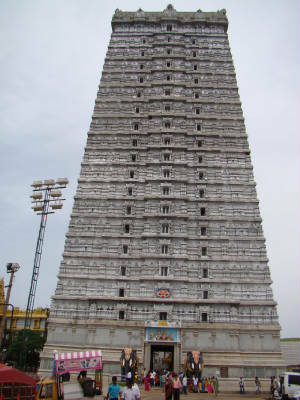 The 20 storied gopura which comes around 250 feets is one of the tallest gopuras in the world. You can spend a couple of ours here and you can move to idugunji and gokarna which are the nearby places to visit. It is situated between Honnavar and Bhatkal. On the Highway (NH 17) you will find a deviation to murdeshwara. Getting one km inside will take you to the temple. The place here being the costal side is too hot. So try to avoid the summer to visit here. But still evening will be good enough even in summers. Food and Lodging is available near the temple oly.